When Raymond Michael was a freshman operatic voice major and football player at California Lutheran University in Thousand Oaks , CA , he was asked to represent the football team on a panel when a hypnotist show came on campus. The hypnotist asked Michael to perform as Elvis; he did, received a standing ovation, and has been performing as Elvis ever since. In fact, Michael has just returned from a successful tour commemorating the 25th anniversary of the death of Elvis Presley. A highlight for any Elvis fan, this mid-western tour found Michael performing in the same venues Presley did 25 years ago during his last concert tour. Raymond Michael will work with any city or agency to ft its budget. His tribute act can include a 7 or 4 piece band or back-up tracks. Michael spends so much time in the audience that any format can work with audiences of all sizes. In addition to performing at small, medium, and large sized venues, if you are interested in a personal, and private event, fund railser, or party performance, just inquire to find out the details. "What an evening we all had watching, listening and participating during your show. Nobody left during intermission...our largest audience. It was as if they were mesmerized. Working with you was a delight." 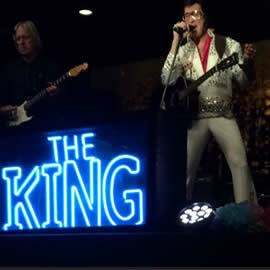 "Your tribute to Elvis was fantastic! We were very pleased with the way you involved the audience in your show. The crowd loved you! You drew the largest crowd we have had in recent years." "You and your very fine and were a major hit. By estimate, 6,000 people attended and the response to the evening has been outstanding." 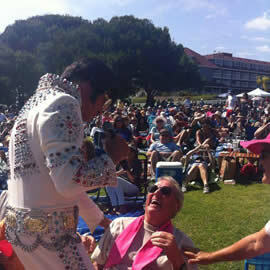 "Raymond Michael's performance each year has consistently drawn the largest audience of the season...over 8,000 people were in attendance...has a large following within our community as well as from throughout Southern California. 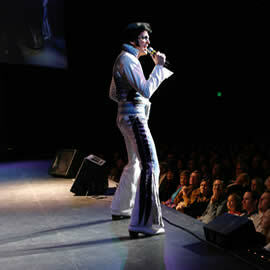 It was a great show and his interaction with the audience had them asking for more." 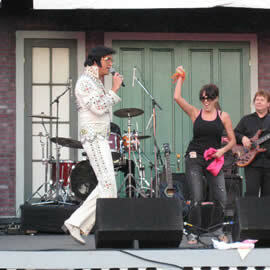 "Your voice is truly remarkable, people couldn't get over how much you sound like Elvis. Our largest concert of the season." "You not only lived up to your reputation as one of the finet acts that I have ever booked, but you also gave us our largest crowd..."
Copyright 2016 RaymondMichael.com All rights reserved.